The campaign against Palestinian women in al-Khalil began with the arrest of City Council member Suzan Abdel-Karim Owawi, 40, on 5 June. She was subjected to extensive, harsh interrogation that was extended repeatedly during that time. In addition to her public service as an elected official, she is a social activist who works to support Palestinian prisoners; she is married and the mother of four children. Safa Abu Hussein, 36, was arrested next after Israeli occupation forces invaded her home and took her to interrogation. Her detention has been extended four times. Rawda Mohammed Abu Aisha, 53, was next to be seized by occupation forces; she was seized when she drove to a checkpoint in Bethlehem and taken to interrogation. The occupation forces also arrested Dima Said al-Karmi, 38, the widow of Nashat al-Karmi, a Hamas activist killed by Israeli occupation forces and the mother of an 8-year-old daughter. She was taken to Ashkelon detention center and interrogated harshly and extensively and deprived of sleep. During her interrogation, she fainted on multiple occasions. Her detention has also been repeatedly extended. Lama Khater, 42, is a Palestinian writer who was seized on 24 July by Israeli occupation forces after they invaded her family home. She was deprived of sleep, insulted and threatened by Israeli interrogators at the Ashkelon detention center. The mother of five children – the youngest only 2 – she is a political analyst and writer whose work is widely published on newspapers and websites. Saida Badr, 55, is the wife of Palestinian Legislative Council (PLC) member Mohammed Badr, 61, who has spent many years in Israeli prison including a recent sentence in administrative detention, imprisonment without charge or trial. Finally, Sonia Hamouri, 40, a university lecturer, was seized from her family home in al-Khalil on 14 August. A number of other women were also detained for several hours and interrogated. The Israeli occupation is accusing the women of communicating information from Palestinians in exile to those inside occupied Palestine, especially activists in Hamas. They were also accused of doing social and charitable work in support of the movement by providing aid to the prisoners’ families. 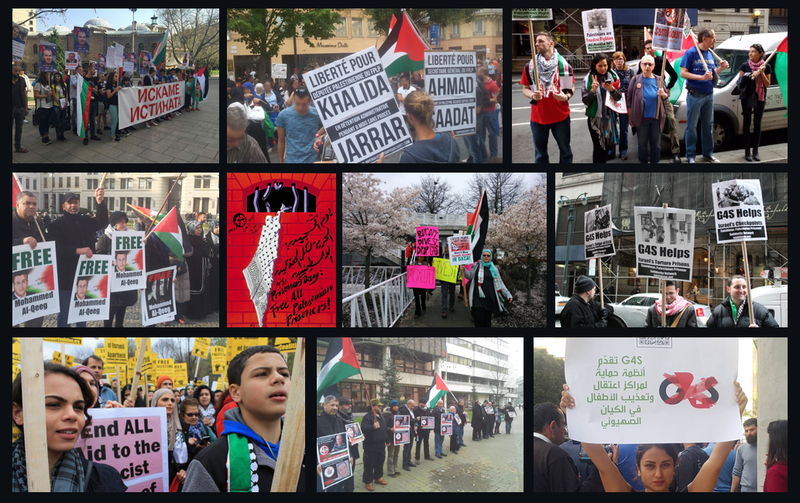 Palestinian political parties and movements are labeled “illegal organizations” by the Israeli occupation, and thousands of Palestinians are jailed for allegedly supporting or belonging to these liberation movements. One of the most common charges against Palestinian prisoners is “membership in an illegal organization,” as participation in most major Palestinian political movements is criminalized by the colonial occupation. These seven women are among a total of approximately 63 Palestinian women prisoners, including several held without charge or trial under administrative detention, such as parliamentarian Khalida Jarrar and student Fidaa Akhalil. Samidoun Palestinian Prisoner Solidarity Network stands in solidarity with these women and all Palestinian prisoners and demands their immediate release. The Israeli occupation military uses media releases and sensationalism in an attempt to justify their targeting and criminalization of the Palestinian people and their political movements.